We propose linear response functions to separately estimate the sea-level contributions of thermal expansion and solid ice discharge from Greenland and Antarctica. The response function formalism introduces a time-dependence which allows for future rates of sea-level rise to be influenced by past climate variations. We find that this time-dependence is of the same functional type, R(t) ∼ t α, for each of the three subsystems considered here. The validity of the approach is assessed by comparing the sea-level estimates obtained via the response functions to projections from comprehensive models. The pure vertical diffusion case in one dimension, corresponding to α = −0.5, is a valid approximation for thermal expansion within the ocean up to the middle of the twenty first century for all Representative Concentration Pathways. The approximation is significantly improved for α = − 0.7. For the solid ice discharge from Greenland we find an optimal value of α = −0.7. 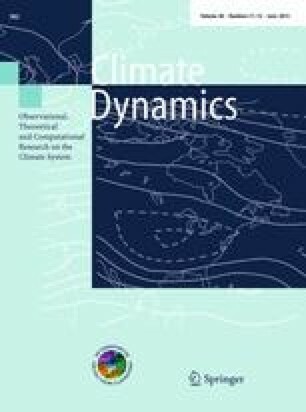 Different from earlier studies we conclude that solid ice discharge from Greenland due to dynamic thinning is bounded by 0.42 m sea-level equivalent. Ice discharge induced by surface warming on Antarctica is best captured by a positive value of α = 0.1 which reflects the fact that ice loss increases with the cumulative amount of heat available for softening the ice in our model. This study was funded by the German Federal Ministry of Education and Research (BMBF). We would like to thank Stephen Price for sharing his data with us.